Of all of Donald Trump's children, Ivanka Trump has probably maintained the highest profile on the campaign trail. But on Tuesday night, after the business mogul officially clinched the GOP nomination during a roll call vote, his 22-year-old daughter took center stage at the Republican National Convention to deliver a speech. 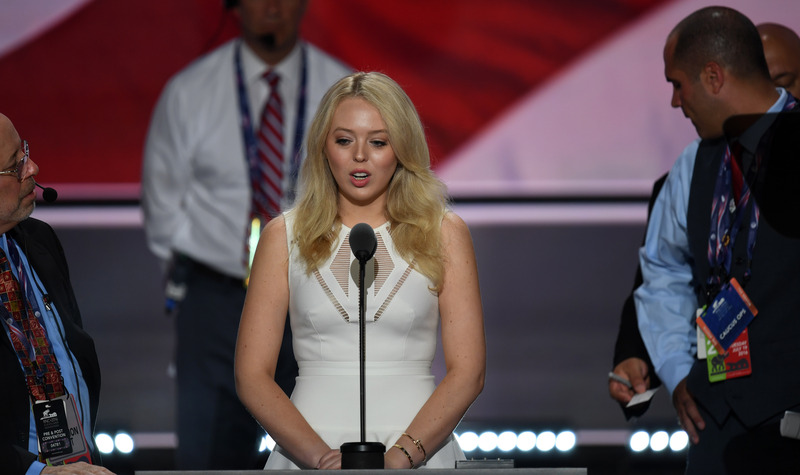 The transcript of Tiffany Trump's RNC speech gave insights into the Trump daughter who has stayed relatively quiet this election season and what she thinks of her father's potential presidency. The recent college graduate's speech came one day after Trump's wife, Melania, delivered remarks that appeared to lift multiple paragraphs directly from Michelle Obama's 2008 Democratic National Convention speech. Despite attempts by the Trump campaign to refute any plagiarism accusations, the stakes were high ahead of Tiffany's speech. But who is Tiffany Trump? Her half-siblings Ivanka, Eric, and Donald Jr., have all been much more vocal during their father's campaign, and her date to the RNC is reportedly a registered Democrat. Tiffany is the only child from Trump's relationship with Marla Maples; her parents separated in 1997, just a few years after she was born. Tiffany subsequently moved to California and lived there with her mother until she started attending the University of Pennsylvania, her father's alma mater. She graduated this year with degrees in sociology and urban studies, and her speech on Tuesday night was an opportunity for her to finally introduce herself to voters — as well as to give them an understanding of what her father is like outside the spotlight. Thank you all so much. It's so amazing to be here with you tonight, and to say a few words about my father, and your nominee for president. Please excuse me if I'm a little nervous. When I graduated college a couple months ago, I never expected to be here tonight, addressing the nation. I've given a few speeches in front of classrooms of students, but never in an arena, with more than 10 million people watching. But like my father, I never back down from challenges, so here I am, a little new to the convention scene, but incredibly honored, and very confident in the good man that America is coming to know. It's often said that with enough effort and determination, you can do whatever you put your mind to, but saying those words and living them are different things, and my father has lived them. It's one of his defining qualities and I've seen it in action all of my life. Whatever he does, he gives his all and does it well. His desire for excellence is contagious. He possesses a unique gift for bringing out that trait out in others, starting with those closest to him. He's always helped me be the best version of myself, by encouragement and by example. He motivates me to work my hardest and to always stay true to who I am and what I believe. That's what he does — he draws out the talent and drive in people so that they can achieve their full potential. That's a great quality to have in a father, and better yet, in the president of the United States. As a recent college graduate, many of my accomplishments are still to come, but my dad takes such pride in all that I've done so far, no matter how big or how small. I still keep all of my report cards, some dating back to kindergarten, because I like to look back and see the sweet notes he wrote on each and everyone of them. Contrary to what you might expect from someone who places an emphasis on results, my dad's comments referred often to the sentiments expressed by my teachers about how I acted in and out of the classroom — just not even focusing on the letter grades themselves. Donald Trump has never done anything halfway, least of all as a parent. My father always asked about my family in Georgia, to make sure that they are healthy and safe. My uncle served in Vietnam, and my 97-year-old great-grandfather served in World War II. I believe the measure of a person is revealed in their darkest times. For me, the measure of a parent is based on how they support and bolster you when you are down. A few years ago, someone very dear to me passed away, and the first call I got — as I knew I would — came from my father. Without his unwavering support and care for me during such a challenging time, I don't know how I would have made it through. As so many know, it is the small loving acts that help an enormous amount in times of grief. My father is good with advice, as you might guess, but he keeps it short, and the takeaway is usually the same: to help us find our own way and our own gifts. If you do what you love, hold nothing back, and never let fear of failure get in the way, then you've pretty much figured out the Trump formula. My dad is a natural born encourager, the last person who will ever tell you to lower your sights or give up your dream. I always looked forward to introducing him to my friends, especially the ones with preconceived notions because they meet a man with natural charm and no facade. In person my father is so friendly, so considerate, so funny, and so real. My friends walk away with a glimpse of all that he is, and all that he means to me — of the strong, protective, kind, endearing man I am so proud to call my father. I never pictured myself saying all of this to a packed arena, but I'm grateful and fortunate for the chance. I have admired my father for all of my life and I love him with all of my heart. God bless you, and thank you.